Country living in the city. 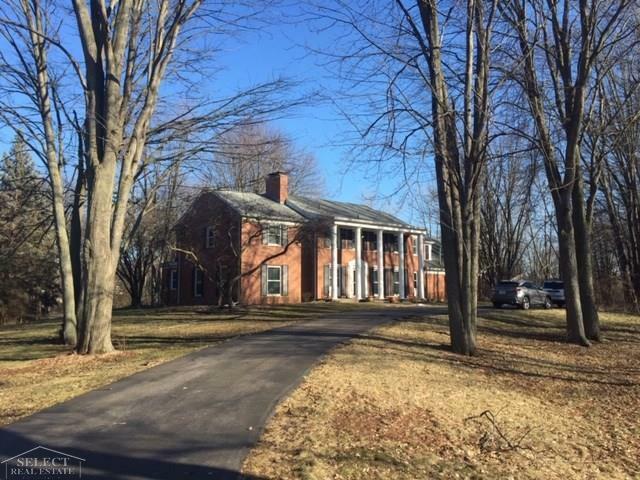 this 4800 Sq Ft. Colonial sits on just over 5 acres with 3 out buildings, chicken coop and a large pond. This large home has 5 bedrooms, 4 full bathrooms, 2 half baths, large kitchen with granite counters and stainless steel appliances. There are two natural fireplaces (one in living room and one in family room currently being used as a formal dining room). Beautiful entry (foyer) with spiral staircase. Huge master suite with private bath, walk in closet and door wall to large balcony overlooking large private backyard. There is a door wall from dining area to a new two level composite deck. Home has lots of newer flooring and many updated windows and doors. Full finished walk out basement, sprawling horseshoe driveway and a 3 car attached garage. It is close to everything you will need.